This wholesome, more-ish recipe is not only a great contender for a feast with friends and family during the festive season, it’s also vegan and absolutely delicious! Cavolo nero and the different mushrooms give it great texture and taste. 1. Preheat the oven to 220º C (200º C fan, gas 7). Put the oil in a large non-stick saucepan over medium heat and add the mushrooms and a good pinch of salt. Cook for 15-20 minutes until tender, stirring until all the water has been released and evaporated. Add the tamari and stir to coat the mushrooms and give them a rich dark-brown colour. Remove from the pan and leave to one side. 2. Add the garlic and onion to the pan, with a splash more oil if needed, and cook soft and translucent. Remove from the pan and add to the mushrooms. 3. Add the cavolo nero to the pan and increase the heat, then add 125ml water and cook until the leaves have wilted and all the water has evaporated. Return the mushroom mixture to the pan. 4. Put the miso in a bowl and stir in 100ml hot water, then add this to the pan, followed by the cream and a squeeze of lemon juice if needed. 5. Spoon the filling into a 28cm pie dish. Roll out the pastry on a lightly floured work surface until roughly the thickness of a pound coin and a bit larger than the pie dish and its rim. Brush the edge of the pie dish with a little water. 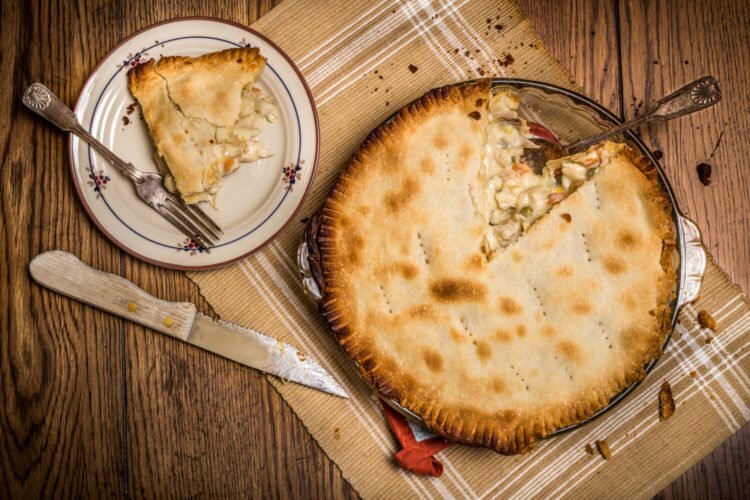 Trim a strip of pastry 1cm wide from the outside edge of the rolled pastry and stick it around the edge of the pie dish – this will help to secure the lid. Cut a circle fro the remaining pastry about 1.5cm bigger than the pie dish to make your lid. 6. Cover the filling with the pastry lid, pressing down firmly to secure. Trim off the excess pastry using a knife, and pierce two holes in the centre of the pie to allow the steam to escape. 7. Put the milk in a small bowl and whisk in the agave syrup. Brush this glaze over the pastry. Bake for 25 minutes or until golden brown and cooked to perfection. Lucy Watson, from whose cookbook we extracted this recipe, is queen of vegan cooking and delish, wholesome meals. Click here for her chocolate fondant volcano pudding – also vegan, also mouthwateringly good. Click on the link to find out why a diet rich in fruits and vegetables contributes to a long life, and how a plant-based diet can improve your overall lifestyle.